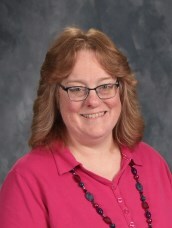 Mrs. Huntington has been the third grade teacher at Calvary since 2002. All of her 20-plus years of teaching have been in third grade! Leslie was born and raised in the northwest suburbs of Chicago, IL. She graduated from Concordia University Wisconsin in 1997 with a Bachelor's Degree in Elementary Education and a minor in computer science. Leslie has served in Michigan, Illinois, Florida, and Indiana. She is married to Jeff, who serves as a teacher at St. John Lutheran School in Indianapolis, and is mother to Kyle, who is a student at Calvary. When Mrs. Huntington is not teaching, she enjoys playing the occasional video game (she has to share with her boys),collecting yarn,weaving, knitting and crocheting dish scrubbies.